Explore this modification of the mixer design into a drying unit with Toshniwal Mixer / Dryer. It is mostly used for powder products, granulates and filter cakes. The product is dried by mixing energy and product in the best possible way. The mechanical fluidisation ensures that all particles are surrounded by the drying medium (cold/ warm/ hot air, inert gas etc.) and an effective transmission of energy occurs. Moisture is thereby extracted from the product. The same perfect quality product for each batch can be achieved by this reliable and repeatable process. The Open System is designed in such a way that makes ambient air blow into the drying system. The air warms up in a heater before blowing into the drying chamber. The hot air is inserted on both side towards the paddles in the dryer. The paddles bring the air through the material, up to the fluidized zone where the particles can be lifted to create a larger surface area to increase the drying rate. The moist air is blown out of the dryer with fine particles which collect in the filter bags, kept in the exhaust side of the dryer. Close System has the heated air blown into the mixer along with the moist product. The heat exchange makes the moisture evaporate from the product. Moist air passes through the filter before it is sucked into the fan. The air is then blown through the cooler for condensation before it is reheated. When drying very moist products, the wet product is mixed with dry first, to ensure that the fluidisation and the high drying rate is maintained. 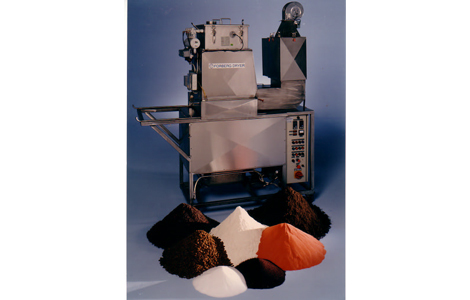 Vacuum mixing and drying as an option is also available for sensitive products within the same design.